Teams skating away from the weekend’s tournaments with gold medals were: Bonnyville Sr. Pontiacs (Senior AA), Lethbridge Headwater Hurricanes (Minor Midget AAA), Lethbridge Hurricanes (Midget A), High Prairie Mavericks (Midget B), Stettler Storm (Midget C), Kitscoty Pitbulls (Midget D), St. Albert Slash (Midget Female AAA), SPS Fuzion (Midget Female A ), Irma Aces (Midget Female B), Calgary Fire White (Bantam Female Elite), Cold Lake Ice (Peewee A), Provost Blades (Peewee B), Winfield Peewee (Peewee C), Irvine Bulldogs (Peewee D), and Okotoks Oilers (Peewee Female A). An incredibly close Bantam AAA series between the Airdrie Xtreme and St. Albert Sabres, which saw a total of nine overtime periods, came to a close when Airdrie scored near the end of the fourth overtime of game five. 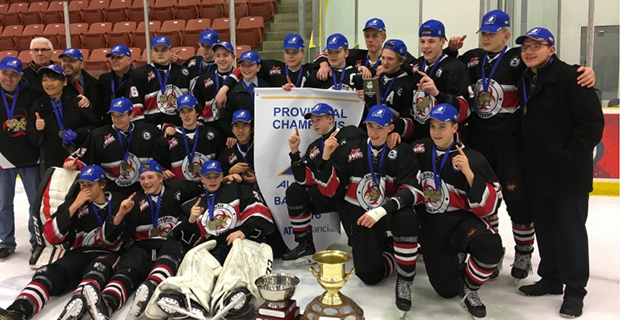 The Xtreme, led by HockeyNow Player of the Year finalist and AMBHL top playoff scorer Craig Armstrong, advance to the Western Canadian Bantam AAA Championship, March 29 to April 1 in Kamloops, BC. The 2018 Provincial Championships tournament schedule wraps up this coming weekend with six tournaments set for March 29-April 1: Junior B (Fort St. John), Junior C (Sherwood Park), Midget AA (Spruce Grove), Midget Female Elite (Calgary), Bantam AA (Edmonton), Peewee AA (Glenlake/Calgary). The Midget AAA Provincials will wrap up by April 1 as well, with the best-of-five series between the Knights of Columbus Pats and Lethbridge Hurricanes tied at 1-1.